To be quite honest, I’m not sure if I should expect a restaurant paying homage to the delicious pig to cook a delicious burger. On one hand, meat is meat, but on the other hand, there are so many things you can do at a pork-themed restaurant before you make a beef burger (not that I am complaining, mind you). The short answer is that hands down, Lardo makes one of the best burgers this side of anywhere and everywhere. I came upon a recommendation of Lardo from a good buddy in the Bay Area, who was in town early for the same event as me. He just so happened to be walking on the same side of SE Hawthorne at the exact same time as us – complete coincidence. 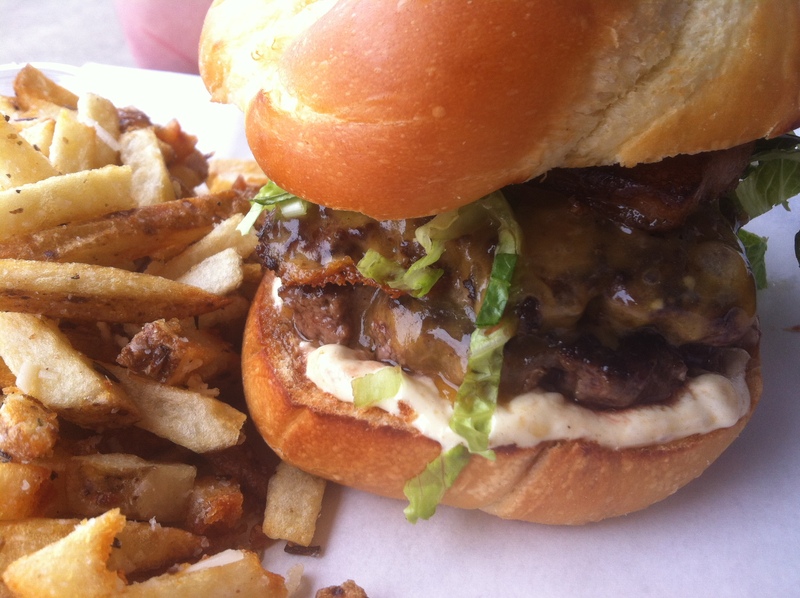 He’d just eaten at Lardo, said the burger was amazing, and that we should definitely try it. We were headed to Cartopia, but burger you say? OK, Lardo it is. I returned a second time that trip, and two more times on my next trip. Half the reason I love Portland is for the food, so if there’s a place I’m going to twice in one trip, you can rest assured there is something at said eatery with which I am simply in love. So let’s meet my object of affection: the Lardo Double Burger. Two patties stacked with Oregon cheddar, Lardo sauce and a thick slice of, that’s right, pork belly ($8). The burger is definitely not for the faint of heart, as it oozes two types of meat juice in every bite. It’s definitely an umami overload, so be prepared for some serious richness. The Lardo sauce is another rich element, but it has a bit of a kick which has a net cutting-down effect to the dish as a whole. This delicacy is held together by a fantastic fresh bun which somehow manages to absorb all the juice without becoming soggy. The bun top is pretty big, but the bread is so light that the portioning is pretty much right on. Lest you think the burger is a work of perfect architecture, it is held together with a mini wooden steak garnished with a slice of pickle. But the best part is when you take that first bite. It’s always a good sign when I bite into a big burger and all these wonderful juices flow into my mouth, onto my plate for fry-dipping, and quite possibly onto my clothes, as well. Maybe I’m getting that extra bit of melting sensation from a thick slice of cheese. But what’s this extra juicy, melty, salty thing sending my taste buds over the savory edge? Why, that’s the humble pork belly – until not so long ago one of the most underrated ingredients…ever. Because the pork belly, when correctly cooked (as it is at Lardo), will melt in your mouth, it offers a more sublime burgering experience than its extremely close relative of bacon. Pork belly just sings umami, and add it to this burger, and you’ve got umami overload. And you just might get some crispy bits too, which add for a nice change of pace while you’re chowing down. Another neat thing about this burger, is that despite all the different elements going on here, the size is not too big, and not too small, and everything really works in perfect harmony…if you’re down with very rich flavors. But I think you get the point about the richness by now. As a side note, I didn’t realize that “double burger” actually referred to two patties – I thought it was patty + belly. Which just goes to show you the soundness of architecture this burger boasts – both patties balance nicely! And don’t you DARE forget the fries. Naturally, the Lardo fries ($4) are fried in, well, do I even need to make you salivate any more? Not only that, but they’re topped with parmesan and deep-fried rosemary. Deep frying fresh herbs is one of the best little cooking secrets around, in my opinion, as it makes stringy herbs crunchy and very edible without taking away their namesake qualities. One small gripe I have is that there’s no small portion of fries. If you’re coming here by yourself, you’re kinda stuck getting the one size, and it could be a little much with your main dish. My thinking is that it would be convenient to have an “add fries” option. Given the portion size, though, I have no complaints about the price, and also, just come with a friend: a burger + splitting an order of fries is only $10 + tip. Seriously, this sizing is my only slight complaint, if you can even call it that. There’s also a good selection of beers and barleywines, and I’m pretty tempted by the mimosas by the pint. Yeah, I had to read that a couple times myself, too. There isn’t much seating inside, unless you want to wait for a few minutes (Lardo is order-at-the-counter, so waiting for a table a few minutes works fine), but come in the warmer months and there are tons of tables set up outside for slow-paced gatherings, and in the winter, the same tables are covered from the elements with easy access to the restaurants interior. As an aside, on my various trips here, my friends have eaten most of the menu, and while there hasn’t been a miss yet, the burger has yet to receive less than three thumbs up. So if you aren’t looking to clog your arteries, why are you coming here you’ll probably find something else a bit less intense to suite your pork fantasies. I’m not sure if I’ll ever try anything else beyond a taste of a friend’s because, well, read above. There’s also a milkshake food truck associated with Lardo, if you desire some sweet with/after your meal. But yeah, who am I kidding, this is one of my favorite burgers out there. I literally have not a single complaint with it, and the accoutrements simply elevate it to an umami-nirvanic heaven. It is one of the most flavorful burgers I have ever had. I can give it no other rating.